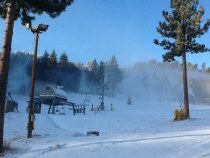 Mountain High Resort in Wrightwood officially opens this Sunday, November 11th, marking the start of the 2012/13 Southern California ski season. 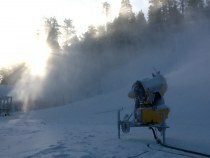 The combination of cold temperatures and recent improvements made for great snowmaking and the Wrightwood resort was able to put down 12 to 16 inches of new snow over the past two days. Mountain High spent more than $1 Million this summer updating everything from snowmaking to learning programs to their terrain parks. They also added value to their season pass by offering FREE skiing at Stevens Pass, WA, Sierra At Tahoe, and China Peak, CA. Mountain High is renewing its annual pledge to the Military by offering FREE Skiing on Veterans Day as observed on Monday, November 12th. Operating hours will be 8:30am to 4:00pm through Thanksgiving and tickets will be $45 for adults (Regularly $69) and $25 for children ages 7 to 12. Kids six and under ski FREE with a paying adult. Ticket sales will be limited. Please arrive early for the best experience. Prices are subject to change without notice. Up to 3 lifts will be available Sunday accessing 4 trails with a good combination of beginner and intermediate terrain. This means there is something for every member of the family including top to bottom terrain features for freestyle skiers and snowboarders. Mountain High offers a full line of rental and retail products along with repair services and food & beverage. The Winter Sports School will also be open with its early-season $99 Special consisting of a lift ticket and one hour private lesson for both children and adults ($140 Value). Due to its early opening Mountain High has extended its Freedom Pass sale to Sunday, November 11th. Prices are up to 57% off for an Anytime Season Pass and benefits include FREE SKIING at Stevens Pass, WA, Sierra At Tahoe, and China Peak, CA. Click here for complete details.